Sparks Computerized Car Care performs expert alignment service to keep your vehicle driving straight. 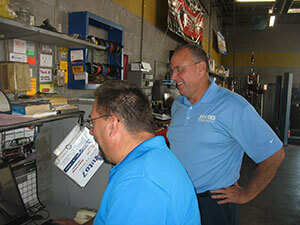 After years on the road, any vehicle’s alignment can be off and require a realignment. We’ll make road travel safer for you, your passengers, and the vehicles in the lane beside you. It may take you a while to notice that your car need wheel alignment service, but the most obvious sign will be your car pulling to the left or right on its own. If you let this pulling go unchecked or uncorrected for too long, it can make road travel dangerous. Also, your tires will wear unevenly and you will be forced to replace them earlier than you planned. Or worse you could experience a tire blowout because the tire tread has unknowingly been compromised. Wheel alignment is a vehicle maintenance that might be overlooked for a time, but doing so will cost drivers in money and safety. An off wheel alignment can instantly be caused by a collision. Not from a serious impact with the vehicle’s body, but rather a tire’s impact with a huge pothole or a curb. These very minor accidents can seriously put your wheel alignment out of whack. The longer you go without the proper attention the worse your vehicle’s alignment will get over time. Pay attention to how difficult it becomes for your car to remain in a straight line after an impact with a pothole, especially if it happens more than once. For the best alignment services in Muncie, IN schedule an appointment with Sparks Computerized Car Care. We use the most advanced tools and equipment to give you an accurate alignment. When you use a lesser experienced repair shop, you won’t be receiving the benefit of our sophisticated equipment. It not only takes advanced equipment to perform precise wheel alignment service, but also a technician with the skills and experience to handle it. Contact us today at (765)273-4298 for expert alignment service.